Can I flood my engine trying to start it? So, here’s another dumb question: why does the raw water that goes through the heat exchanger get pumped into the exhaust system? Why not just send it overboard separately? Is it just to cool the exhaust? Yes, I have seen an Alden iirc, that had concentric copper exhaust, water in outside annulus, exhaust on the inside. Sounds like maintenance nightmare but new owner worried cut a section open and good as new. It has to be higher than your high point vent on the sea water pump. That is there to prevent back flow on engine shut down. James, do you think that little anti-siphon valve would keep up with the water pump??? It is there to prevent siphoning not back flow. Recipe for disaster. Assuming it never fails, gets clogged (and fails) or disintegrates from the heat (another fail cause). That's right, and silence the exhaust. The raw water cools everything starting at the injection elbow and everything downstream. An inch or 3 settles in the base of your muffler as exhaust pressure forces plugs of water out of the muffler(which almost eliminates the exhaust sound), and through the rubber exhaust hose. The high point vent can open or not closed tightly in both. This thread has mingled both condition 1 and 2. That was me, Leslie. In fact, they used to build wet exhaust systems that didn't have this exact problem. This 1961 exhaust was built of two copper pipes, one inside the other. It had to fabricated to the boat, bent, and the ends in the outer pipe brazed so as to form a separate water chamber, around the hot innder exhaust pipe. The the fabricator added taps at each end forming an outer chamber isolated from the inner exhaust pipe. The end just aft of the exhaust manifold connected to a hose off the raw water side of the exchanger. This pumped raw water around the inner pipe, cooling it, and then the raw water exited out of the double pipe just before the high loop under the aft deck. Out that exit, the raw water - via a smaller copper pipe, entered a cast iron muffler where it was mixed - safely below the high loop, and exited the stern. No way for raw water to enter the inner exhaust and flood the engine. What worried me is that there is no way of knowing the condition of the inner pipe. When it failed, raw water pumped in before the exhaust pressure built, would immedietley flow into the exhaust manifold and engine. Sadly, it had a century of use left. But how would you know? Cost alone makes this system obsolete. These are smart questions Mark is asking. Many people have no idea what's going on it their wet exhaust system. Yes. The water cools the exhaust gases which are around 1K*. Cooling the exhaust allows the use of synthetic/rubber hoses which makes it easier to run the exhaust out of the boat. The water lift muffler helps to dampen the sound of the motor, which makes motoring for longer distances more tolerable. So, naturally I am trying to work out in my head if there is a design to prevent this. sorry for spelling. first of all you should find out, if you are in danger. do you have raiser or not, is your wet ehsost water inlet higher, then muffler and ehsost outlet. if you are not sure, test is simple: disconect exhost hose from engine elbow or raiser and try to fill it with water(hose or bukket). if it fills, you in danger, if drains out-nothing to worry about. if you are in danger, I would put a bypass hose with valve from before and after pump to prevent running dry and damage in any convinient for you place or just put 3 ways valve befor exhost, so water goes to bilge. My engine exhost is much higher, than mufflerand i can crank it all day long, but nothing happens. When I checked my exhaust system elevations out, I found that my boat would "slosh back" the water seal into my not running engine, in a near bow on sea state of 2-4 feet. 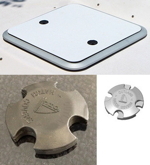 Some people install a seacock valve on the exhaust throughhull, especially, if they use the boat for long off-shore passages. Of course, the trick is to remember to open it, when you want to use the engine. "Banana in the tail pipe" trick. 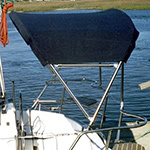 Check out this link my post#28 for my boats muffler system. Note there is always seal water in the muffler. In the Elevation view, imagine the bow going down in say 4 foot seas. Water will slosh into the non running engine open exhaust valve. Most water quench exhaust systems were designed for calm seas. True. From what I read, on long passages, people were having problems with following seas pushing water into the muffler. So the seacock was not to prevent the remnants of the water in the muffler from sloshing back into the engine, but to prevent more sea water entering the muffler from behind. In order to prevent your problem (sloshing water from the muffler entering the engine), you might need to drain the muffler for a long passage. A major PITA, I imagine. you might need to drain the muffler for a long passage. A major PITA, I imagine. I suggested that my forum post, but no one responded. Most of my sailing, in high sea states, thus I like to start my engine just in case I need to maneuver quickly. Others may want to consider a muffler drain. There is a way to avoid this. Put a tee in the uphill side of this loop and run a tube from that tee to a small through hull at the rail - above the water line but slightly below the level of the top of the loop. Now when cranking the cooling sea water goes overboard via this new tee, tube and through hull. Very little of it goes into the mixing elbow and the water lock because the sea water volume at cranking speed is pretty low. The waterlock section does not backfill and motor does not hydrolock. When the motor is running the volume increases and the sea water also spills into the mixing elbow and overboard thus cooling the water lock section. You need to size the new tube a little smaller or put a simple valve at the through hull if you want. You don't even need the vented loop because this new overboard prevents siphoning too. Good reading concerning exhaust design at Seaboard Marine. https://www.sbmar.com/articles/designing-a-marine-exhaust-system/ . Tony discusses the fix I describe here but he gives you pictures and diagrams too. jssailem and markwbird like this. A seacock in the exhaust might still help prevent the water from sloshing backwards from the muffler as well. If the exhaust line is closed then no air can enter the muffler from the back, so a column of water won't be able to go towards the engine without generating suction in the muffler. That suction would stop the slosh, unless it wasn't a full column in the line between the elbow and the muffler. Having said that, I'd be really worried about forgetting to open a seacock like that. We know people sometimes forget the intake seacock, and a burnt impeller is nothing compared to the mess that a stopped exhaust may cause. I was blessed with a very easy-starting Yanmar 2GMF, usually one bump on the starter button and it just catches and runs with the throttle set to idle position, even when stone cold and not run for a week. I have also been "trained" by electronic fuel injection automobiles for the past couple of decades to forget about "pumping the accelerator" or even opening the throttle while starting. So, when we had a guest on board (sister in-law) and the engine didn't catch on the first, second, third... tenth attempt bumping the throttle for 2-20 seconds, it just didn't occur to me to try opening the throttle. For my engine just a mid-range opening seems to be all it needs to catch when it doesn't want to start at idle throttle. After that, it went back to easy starting until our last trip - that time I remembered to try the throttle opening after about 5 attempts at idle, and caught first time. Wow! Thank you for gracing my post with your knowledge and wisdom, Stu The Engineer. In addition to all of your knowledge about diesel engines I think you really nailed the tone I was looking for in a response. Thanks, again. OK, how's this for a better tone? The total volume of a wet exhaust system (muffler/hose), and the rise to the intake manifold should be more than adequate to handle coolant water, for any reasonable pitch angle of the boat. Offshore we have a couple of nerf footballs which fit the thru-hull exhaust port nicely. That is a $2 fix. When I designed my system, for that reason - volume - I went with a larger capacity water-lift muffler. As a typical old CCA design, the 'resting' volume of raw water is at a max. The extra volume keeps all the flow back in the bottom of the muffler. Then to not worry about back flooding(and adding more water volume), I resisted the temptation to put my exhaust outlet in the counter where it wouldn't show. I stuck with the 1959 design drawing thinking Alden design had a long track record of engine floodings, and picked this location. Even with the high loop before the exit for added protection (my new hose high-loops all the way up the aft deck), I see a potential for a plug of water to get pushed up, especially if the outlet were re-located to the counter. In a seaway, running downwind (something we do for hours and hours), if the outlet stays under for several waves, a plug may push - and over the high loop,...and you have a siphon. So I kept the high outlet location, raised the raw water vented loop to just beneath the bridge deck and so far so good. Even this high location still goes under for short periods. Any sort of seacock wouldn't work for me. It wouldn't be easy to get to, too much potential to not use it - or use it and forget it.